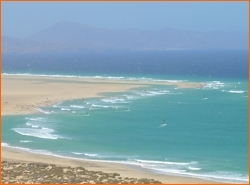 Fuerteventura is one of the seven islands that make up the archipelago of the Canary Islands. It is the easternmost and is separated from Africa for just 100 kilometers, and is the second largest, with 1659 square kilometers, after Tenerife. Separated by just 11 kilometers from Lanzarote and 80 kilometers from Gran Canaria, is the oldest island of the Archipelago with an age estimated at 21 million years, and precisely because of his "advanced age", this island has soft relief (highest mountain is the "Pico de la Zarza", with 807 meters), and erosional processes have acted on its surface for a long period of time, and a lack of active volcanism that could "regenerate the surface. The weather is just perfect, with average temperatures of 21 °, with very nice winters and summers hot nothing (rarely above 30 degrees). The rains are very low, favoring a desert landscape. If anything characterizes Fuerteventura are incredible and varied beaches (the best in Europe, and are probably the best in the world). There are more than 100 beaches of all types: tourist, isolated, all natural, black sand, white, golden or blonde, with waves, no waves, with all services or total wilderness. Fuerteventura was not one of the most important islands of the Canary Islands due to lack of water as moisture-laden clouds that are carried by winds, pass on Fuerteventura long as no mountains are obstacles where the rain download . (Today, thanks to the efficient desalination plants on the island, the water supply is guaranteed).